Chuddie, chuggie, or chewnie is a saft, cohesive substance designed tae be chowed withoot beib swallaed. Modren chuddie is componed o guim base, sweeteners, safteners/ plasticizers, flavours, colours, an, teepically, a haurd or poudered polyol coatin. Its textur is reminiscent o rubber acause o the pheesical-chemical properties o its polymer, plasticizer, an resin components, which contreibute tae its elastic-plastic, sticky, chowy chairacteristics. ↑ "Ingredients technology - ICGA". www.gumassociation.org. Retrieved 2016-12-15. ↑ Estruch, RA (2008). 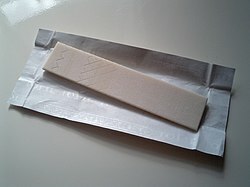 "Gum base". In Fitz, D. Formulation and Production of Chewing and Bubble Gum (2 ed.). Essex: Kennedy's Publications Ltd. pp. 93–118. This page wis last eeditit on 29 Apryle 2017, at 20:49.